Where to draw the line. Boundary decisions. One of the topics that cropped up during my recent supervisory meeting was how I’ll be bounding my study. Although I’ve given this some thought, it’s probably fair to say not enough. I’ve tended to think about areas I’m less likely to explore, thereby allowing me to exclude them, rather than specifically addressing the limits of what I do want include. It’s possible that I may have been influenced to some extent by some of my reading. Hine (2009, 18) is quite clear in advising us “…it is important not to assume that we know in advance what the Internet is.” which then leads on to “ …a set of fieldwork boundaries is the outcome of a project, rather than its precursor.” (2009, 18). It’s not entirely clear at the outset what those boundaries might be. Although some perceive a distinction between the online and offline worlds, as I’ve discussed in earlier posts, that apparent boundary is becoming increasingly blurred. My research begins in Twitter (online) certainly, but as I made clear in those earlier posts, it’s also likely to move offline in order to follow the activity of the actors involved. We also have to be aware how different Twitter will be manifest when used in different contexts; there isn’t one Twitter, but many, each person seeing and using it in their own way and perhaps each individual using it differently as they shift from context to context. Kendall (2009, 21) advises that researchers “allow these meanings to emerge through engagement with the cultural context and the people within it.” My supervisor’s caution once more returns and I see this as another possible mechanism through which the study might expand out of control. Kendall does however throw me a lifeline in offering three possible boundaries, together with three spheres of influence which might have an influence. Spatial Questions of who, when and where to study Initially my study is bounded within Twitter, but this is inevitably a loose boundary; activity will move out to other online environments (blogs, linked sites) and offline (schools, meetings, conferences). The study will focus predominantly on English-speaking teachers, but may also include other educators. In the first instance, these will be drawn from those I follow on Twitter, but that too is shifting ground as I follow new people. This boundary is determined by my research question in one sense; in order to express an opinion about Twitter in professional learning, you have to be using Twitter. I can only (easily) observe those people as a result of having followed them. There are subsets of the Twitter educational ‘community’ which associate around particular interests or associations, so monitoring the activity of some of these groups might prove fruitful. Another boundary could be specified by choosing which group(s) to follow. Temporal Time spent and issues of beginning and ending research First and foremost, my research is bounded by the time limits of my PhD which is funded for three years. Here then is a somewhat immutable boundary. I have available just over a year (+ or – a bit) to gather data, so another boundary will be determined by what can be achieved within that time. Spanning (at least) a year should mean however that any interesting annual events can be captured. Since I follow educators from around the globe, there will be activity in my Twitter stream twenty four hours a day. I could monitor activity almost continually, but that is, for an individual researcher, unlikely to be manageable for a protracted period. Here then is a flexible boundary which I can influence, though at this stage of the research, it is not clear what an appropriate time period would be. Relational Mainly relationships between researchers and the people they study Given the target populations mentioned in the above sections, the relationships I have with potential participants spans a wide continuum. This ranges from a tiny number with whom I’ve worked and know well, through those I’ve connected with online and met offline, to those with whom I’ve some contact online only and finally to those I follow, but with whom I’ve never had an exchange. Should I need to follow up any emerging areas of interest with anyone (and later when selecting interview participants), it might seem that those with whom I already have a relationship might be the ones to start with. There are of course a number of points both in favour and against such a notion. Practical Constraints imposed by the resources available, or the skills of the researcher. Collecting tweets automatically using the Twitter API imposes a number of constraints, including the number of tweets you can collect in a given time and how far back you can sample. Without developing the necessary programming skills, a researcher is limited to the tools currently available off the shelf, although there is in fact quite a reasonable choice. Following activity offline may not be possible due to geography e.g. if a group of teachers choose to take a discussion further by meeting up in bar in San Francisco, I’m unlikely to be able to follow up that lead. Conducting online interviews with educators brings certain practical (and temporal!) considerations. Mutually acceptable tools which serve the needs of a research interview i.e. stable audio channel (plus others to share images/docs?) which can be recorded reliably. Setting boundaries then remains a challenge, especially given the degree of overlap between many of these categories. So to gain a better insight into avenues which might be more interesting and more informative to explore, I’m aiming to undertake a pilot study in the second half of this first year. In addition to yielding data on appropriate methods, it should also bring a little more clarity to how the study might be better bounded. 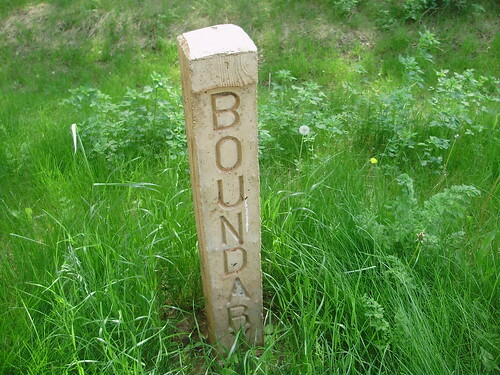 Analytical – project boundaries can be influenced by theoretical and analytical decisions. For me, electing to use actor-network theory has resulted in some of the boundaries above becoming more blurred, since the need to ‘follow the actors’ will influence the paths taken. In breaking down some of the boundaries which might naturally limit the study, such as the human/non-human one, it makes the process of drawing the boundaries that much more difficult. Ethical – the influences of ethical decisions, especially those taken to protect participants. There are some places ethics will not allow the research to go. In the case of Twitter, some people ‘protect’ their tweets whilst others may ‘block’ individuals; in effect they’re pulling up the drawbridge and expressing a desire for a greater degree of privacy than the default settings specify. This wish has to be respected by a researcher, even if the researcher is within that circle of privacy. Personal – those aspects of the researcher’s background which influence decisions e.g. personal proclivities, skills, history. The (initial) sample of those I follow on Twitter has been determined by a number of decisions I’ve made over the years and consequently will be influenced by those choices. What criteria did I use when choosing who to follow? I’m also restricted by my (lack of) coding skills which means that any data I would like to gather automatically will be limited by tools which others have produced. I’m not sure I’ve managed to herd these boundary cats yet, but Kendall’s suggestions have at least prompted the process of thinking about the factors involved. Hine, C. (2009). How can qualitative internet researchers define the boundaries of their projects. Internet inquiry: Conversations about method, Thousand Oaks, CA: SAGE, 1-20. Kendall, L. (2009). How can qualitative internet researchers define the boundaries of their projects: A response to Christine Hine. Internet inquiry: Conversations about method. Thousand Oaks, CA: SAGE, 21-25. Affordances … just one little word!